When I am vending the farmer’s market, offering my Muscovy duck and rabbit meat for sale to local customers, I often spend half of my time explaining my favorite recipes and how best to prepare my meats. Both rabbit and duck are ‘unusual’ and many customers have never cooked them before. I often refer to Hank Shaw’s book, “Duck, Duck, Goose”. I taut ‘pan seared breast’ as the best recipe ever for featuring my Muscovies in your kitchen, and pan seared breasts ARE the most delicious thing ever. But honestly, the best recipe for a ‘duck virgin’ isn’t necessarily the best recipe, it’s the EASIEST recipe that brings out the most flavor with a high success rate. THIS is my new most recommended recipe. *Apologies for the terrible ipad photos. I just wanted to get to EATING not photographing. I am not going to be overly specific with this ‘recipe’. I want you to feel free to put what you want into this dish, and to cut the meat in a way familiar to you. The basic ingredients needed are good stock, duck meat, mushrooms. You could use locally foraged wild mushrooms. You could pick up some oysters from the farmer’s market. You could use skinless breasts or thighs or skin on breasts. Spice it up, add more veggies: you get it, it’s versatile. 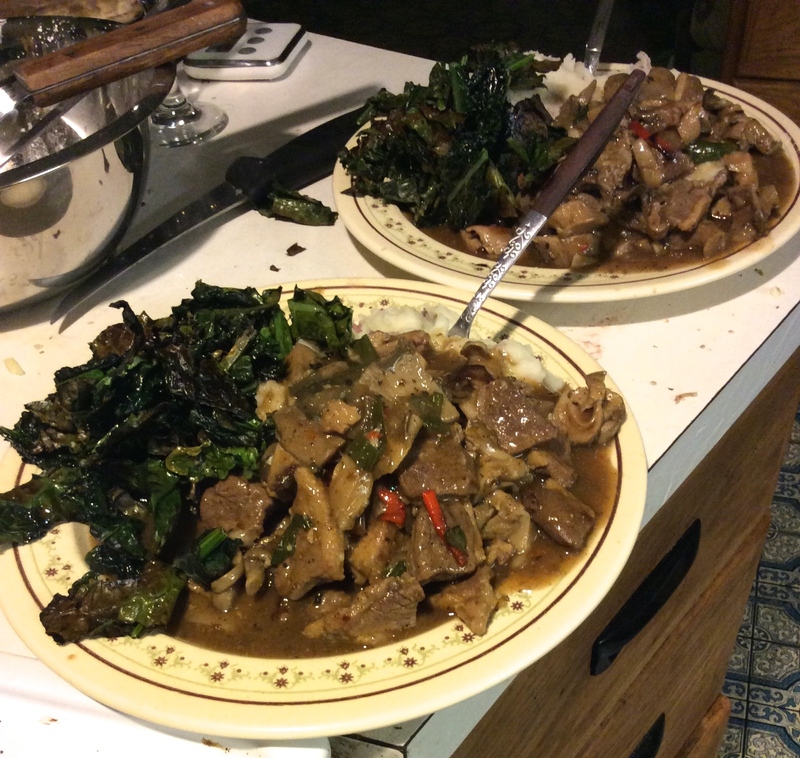 Read on to see how I prepared this dish then try it your way. Enter: fresh muscovy drake, about 5 pounds. First I breasted the bird and put aside the remaining carcass (the thighs will become confit and the carcass will become rich stock). I risked flabby skin chunks and sliced the breasts about 1/4 to 1/2 inch think with skin on. The fat under the skin rendered nicely and i didn’t notice anything gross about the skin, but you could remove it first. The fat will add quite a bit of flavor, though so leave it on and see what you think. After slicing, I tossed my meat into a medium hot cast iron pan with some salt and pepper. Once the fat began to render out, i added some chopped garlic and onion with salt. Stir, stir, stir until the meat is mostly cooked and there are even some crispy bits on the skin. Next i added some roughly chopped oyster mushrooms from the vendor next to me at market. 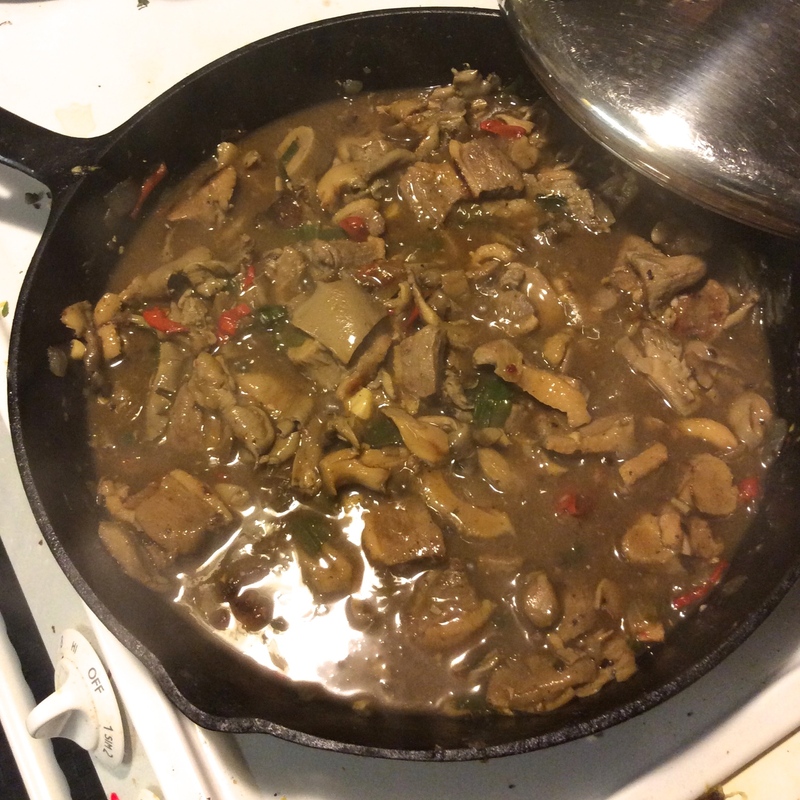 You may choose to put a lid on to steam the mushrooms more while they cook, or not. I also threw in some mildly hot peppers. Continue stirring and cooking until the mushrooms are softening, sprinkle a tablespoon or two of flour around the pan then add most of a quart of stock. *Hint: Want an even EASIER way to cook this recipe?? To achieve a ‘shredded’ style meat that is super tender, place the whole duck in your crock pot and cook on high for 5-6 hours with a splash of stock and your favorite herbs. Add the mushrooms halfway through cooking time. Remove the bones from the meat, add a bit more stock if necessary and your favorite thickener: voila! Stock: i make and can my own. I prepare my stock with mostly duck and chicken bones – either from raw or roasted carcasses. I cook my stock down thick enough that the gelatin sets up when refrigerated. This is some seriously flavorful, rich, nutritious stuff. You COULD of course use store bought stock but do me a favor: save the carcass from tonight’s dinner and make your own homemade stock for next time. You can freeze it if you don’t know how to pressure can. Bring this gravy to a boil then turn down and simmer until it’s getting good and thick. I added a bit of cornstarch at the end to thicken it up a smidgeon more. Served over homegrown mashed potatoes with a side of kale almost-chips and we both about swooned into a food coma. This much meat should have served 3 or 4 but we ate almost all of it. I’m not sorry: it was delicious! So, the next time i have a ‘duck virgin’ at market, i will direct them to this recipe. Let me know how it turns out for you! Follow you on Facebook. I’m an old lady and looking back 50 years I don’t think I would been as productive then as you guys. I think of you all as a true Renaissance couple out there. Your family must be so proud of you both. You know of course an illustrated cookbook should be next…..use your spare time. hi, Dianne! I think we’re slowing down a bit here, too – and YES this blog was actually ‘supposed’ to be rough draft for a book….